The scene at Kroger Fuel Center at Newport Pavilion. FTM file. 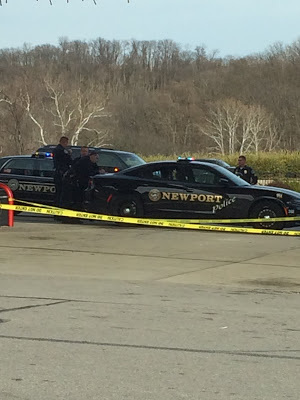 Yellow caution tape outlined the fuel tanks at the Kroger Fuel Center at The Newport Pavilion Tuesday, while multiple Newport Police units were on scene, which prompted many messages to flood the FTM tip line with questions about an ominous-looking crime scene. While the scene looked menacing, it was a simple case of ill-timed routine maintenance on the tanks coupled with a traffic stop. Two individuals ended up being cited for possession of a controlled substance. Amanda Schott, of Cincinnati, and Kenneth Schulte, of Amelia, were pulled over by police for a traffic violation. According to police records, the pair were allegedly in possession of Oxycodone, Alprazolam and Adderall, having hidden the pills in non-conforming containers within the compartment under the radio, under the driver's seat of the car and in Schott's purse. Schott, the passenger in the vehicle, also admitted to having snorted the Oxycodone with the driver prior to the stop. Schulte advised the officers that he didn't have a prescription for the pills. Both suspects were cited and released.